September 11, 2001. Ever since that day, The events of my day have been firmly etched in my mind, so I thought I’d share them. I was living in Orlando FL at the time and September 11, 2001 was moving day for me. I was moving to a new apartment near the Orlando airport. My cousin Rob was in town to help me with the move. We had gotten a later start to the day than usual. We loaded up our first round of boxes into my Cherokee and hit the road around 10am. Seemed like a normal day. The trip between apartments was about 15 minutes so I put in my trusty copy of Billy Joel’s “Songs In The Attic” CD. Got midway through track 1 “Miami 2017 (Seen The Lights Go Out On Broadway).” If you’re not familiar with this song, Billy wrote it in 1976 as sort of a science-fiction story about the destruction of New York City. “Seen the lights go out on Broadway. I watched the mighty skyline fall.” As we were listening to the song, the disc started to skip. Slightly annoyed, I turned off the disc and put the radio on to 101.1 WJRR (Orlando’s Rock Station). Needles to say.. there was no music going on.. the mid-day DJ’s were talking with quite a serious tone. At the time, they were talking about how Disney & Universal in Orlando were closed and downtown was a ghost town at that hour. Unaware as to what took place that morning in NY, DC, and PA, Rob & I first thought something had happened in Orlando. Moments later, they began to talk about the towers falling. It didn’t seem believable. We soon arrived at our apartment where Michelle, my new roommate, who is a New Yorker sat in front of a little black & white TV and watched the coverage with her Grandma. Nobody could believe what had happened. They had no idea if anyone back home was safe or not. Rob & I hadn’t eaten yet so we decided to head to Bennigans to grab lunch.. The restaurant was mostly empty. We sat and watched the replays of the attacks as we ate lunch.. Nobody was talking. Everyone just sat with their mouths open.. unable to comprehend what had occurred. I was so conflicted as I knew I had to finish moving but didn’t want to tear myself away from the TV so we kicked it into high gear and finished moving into my new apartment. We finally were all moved in to my new place.. I was exhausted but didn’t care… I was fixed to the coverage. I spent the next several days trying to wrap my head around what had happened… I still didn’t understand why or how this all happened. My friend Liberty, who at the time, was playing drums for Billy Joel, went to NY to play the America: A Tribute To Heroes telethon with Billy. I remember him telling about how they had no idea where they were going, the secrecy of all of it and the surreal experience of him flying so soon after it happened. Nobody knew what to do, how to feel, or if something else would still happen. The world had changed. I actually found myself in NYC on the 5th anniversary of 9/11. I was touring with Ashton Allen. I remember being surprised with how ‘back to normal’ NYC felt but still felt very reminded on what happened on that day in 2001. I recall us not being comfortable with staying in the city on 9/11 so we left town after the show. Ten years after the towers fell, I found my wife & I fixed to the TV again, soaking in all of the documentaries & 9/11 specials. I didn’t see 8am-Noon unfold live on TV as it happened, so it was very surreal to watch, nearly 10 years later, a replay of NBC’s coverage of the attacks. 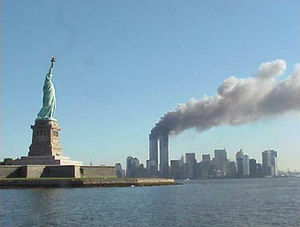 So many days come and go that you’ll never recall, but September 11, 2001 is a day that remains clear as can be. I’m not sure what prompted me to share how 9/11 unfolded for me, but I just felt the urge to get it out there. So there it is. That’s where I was when the world changed.